When a client reaches for the door of a reception, they may have a preconception of the company. The reception and all the proceeding touch points a client (or any visitor) experiences in their journey through the space is an opportunity to set their preconception straight. One of the most effective touch points to reinforce the brand is through human interface. Having protocols in place of how employees treat customers in these face-to-face interactions is an operative way to convey your brand and should not be over-looked. 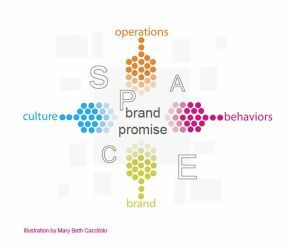 However, the design of the physical space should support employees in easily acting out these behaviors and fulfilling the brand promise. The design can also provide other effective touch points to help form the overall experience.